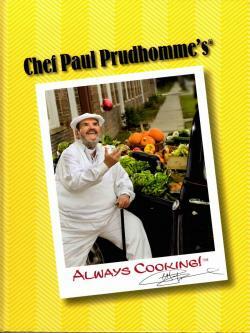 Excerpted from Chef Paul Prudhomme's Always Cooking! Always use fresh ingredients when available. Always start with with food at nearly room temperature. To get the best flavor, remove excess moisture by patting meat with a clean paper towel before seasoning or applying heat. Apply oil to meat or vegetables, instead of in pan. Always start with a hot pan. Season and taste every step of the way. Be careful to not overcook your meat, chicken, or seafood. Make sure to have a good meat thermometer on hand and use it to know when meat is cooked. For more flavor when making sauces or soups that contain meat: season and brown off meat, then set aside and complete sauce or soup. Then add browned-off meat and finish dish. Add butter at the last moment to get the taste, but not the fat. Always remember that whatever is added last to the dish will be tasted first; i.e. garlic, sesame oil, ginger, butter, etc.